SEOUL, Oct. 10 (Yonhap) — tvN’s weekly variety show, “Journey to the West 5,” took the No. 2 spot on the weekly TV chart, jumping four spots from a week ago, data showed Wednesday. The fifth season of the show, on air since Sept. 30 and made by popular producer Na Young-seok, recorded a Content Power Index (CPI) score of 257.7 for Oct. 1-7. 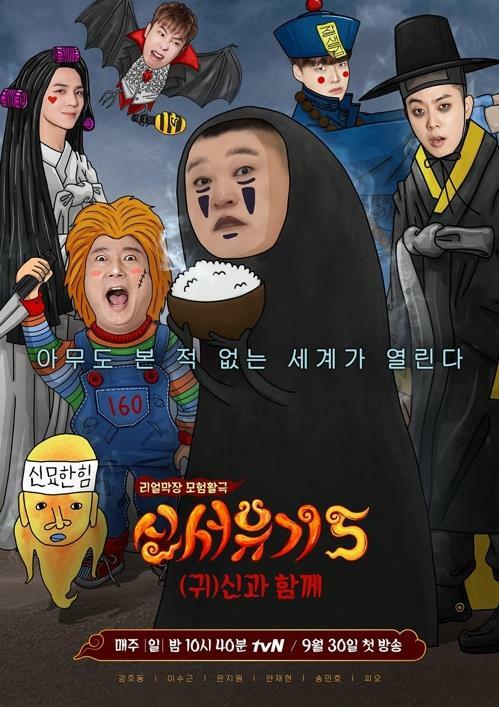 For the two episodes aired, cast members, including comedian Kang Ho-dong and Lee Soo-geun and rapper Eun Ji-won, dress up as various ghost characters, solve hilarious missions to get award money and travel to Hong Kong where they will continue playing games. The top spot went to the new television series “Where Stars Land,” which premiered on SBS on Oct. 1. Starring Lee Je-hoon and Chae Soo-bin, the romantic drama revolves around a new employee shrouded in mystery and her colleague at Incheon International Airport. The series recorded a CPI score of 266.6. The CPI, created by CJ E&M and Nielsen Korea, measures the level of popularity, social media presence and influence on consumer behavior of entertainment TV programs aired on three major terrestrial networks — MBC, SBS and KBS — and seven cable channels owned by CJ E&M — including tvN, Mnet and OCN — during prime time. JTBC, another cable network that airs some highly popular entertainment shows and dramas, is not included in the measurement.